"Vanilla and pear are a flavor-match made in heaven. 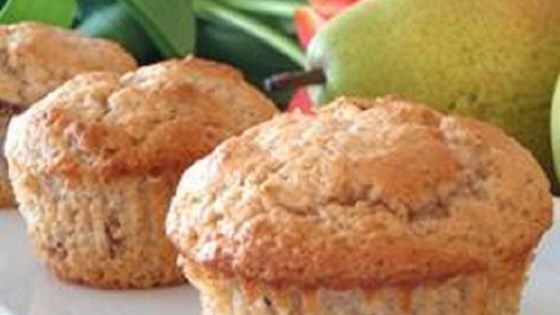 Tender, light, and moist, and with the added goodness of whole wheat flour, these sweet vanilla pear muffins are great for breakfast or a snack. Store in an airtight container in the refrigerator for up to 3 days. These muffins do not freeze well." Preheat oven to 450 degrees F (230 degrees C). Grease or line 12 muffin cups with paper liners. Whisk whole wheat flour, all-purpose flour, sugar, baking powder, and salt together in a bowl. Whisk yogurt, oil, egg, and vanilla extract together in a separate bowl until smooth. Stir yogurt mixture into flour mixture until batter is just mixed; fold in pear and pecans. Spoon batter into the prepared muffin cups. Place muffin tin in the preheated oven; reduce heat to 350 degrees F (175 degrees C). Bake until tops of muffins are browned and a toothpick inserted in the middle comes out clean, 20 to 25 minutes. Cool in the tin for 5 minutes before transferring to a wire rack to cool completely. Select a firm-fleshed pear such as the Bosc variety, as a softer fleshed pear will tend to 'melt' into the batter. I sprinkled the tops with coarse sugar before baking. They turned out perfect -- will definitely make again!